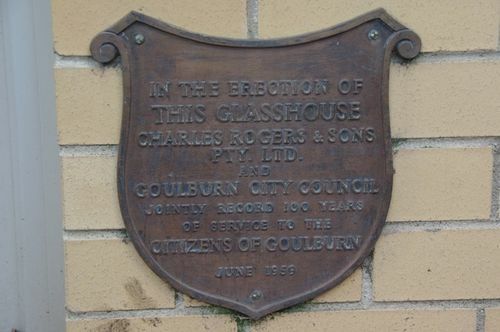 Plaque from the glasshouse which was erected in 1959 in Belmore Park as a record of the centenary of service to the citizens of Goulburn by Charles Rogers & Sons Pty. Ltd. The plaque also jointly reords 100 years of service by the Goulburn City Council. The glasshouse was replaced by a new conservatory in 2000. Charles Rogers arrived in Australia with his family in 1859. They settled at Goulburn, New South Wales, where his father set up a small cabinet-making business and Charles continued to learn his trade. Rogers prospered and the cabinet-making factory employed thirty workers. He had his own network of horse-drawn vans to supply furniture to his agents dispersed from Cooma to Wagga Wagga. Also a retailer and importer, he established a sixty-horse coachline between Goulburn and Yass and ran a livery stable. A great lover of horses, he took pride in driving his own four-in-hand and enjoyed the good things of life. In 1879 he moved into new premises known as the Goulburn Arcade in Auburn Street, designed and built under his own meticulous supervision, and there he became the 'universal provider'. The reputed value of the building, site and stock-in-trade was £90,000. From 1885 his business enterprises expanded south with the railway. Rogers and Sons had substantial business holdings in Goulburn and the surrounding towns and cities and at the centenary of the of Rogers Department Store in 1959 it was decided to make a mark in Belmore Park and they donated money to build a new glasshouse.